The Spanish Maestro of deepest sonic meditations is back again with his latest aural cathedral entitled “Source Of Present”. As a reviewer, even if it’s just my free time hobby and passion, I should maybe stay more objective, however, many of you might have known and it’s no secret that I have been always utterly fascinated by Max Corbacho’s soundworlds. I am simply unable to hide this and when a new album by Max is announced, every time I am looking forward to it just like a small kid for his fave candy. Of course “Source Of Present” CD, created during 2015-2017 and released at November 10th on Max Corbacho’s own Silentsun label, was no exception. How could it be? The album comes as a 4-panel digipak with glossy cover image created by the artist himself, while the layout duties are handled, as usual, by Michael Rodriguez Pletz. “The Beginning Of Remembering” is not only the opening, 24 minutes long opus, but to be straight, also one of the most monumental epics Max has ever carved and undoubtedly one of the most jaw-dropping compositions since his ultimate milestone “The Ocean Inside” released at the end of 2012. How can I resist when such gargantuan driftscape invades my listening room? Ultra tenebrous and voluminously humming, yet gracefully multidimensional stratums swiftly steal the whole, breathtakingly immersing scenario. However, warmly spellbinding vistas clandestinely permeate as well and persistently juxtapose with tiding ear-blowing transcendental meridians. I am loosely gliding across the unfathomably subterranean Eden, enter now and experience this pure magic!!! “Soul Of The World”, clocking to 7-plus minutes mark, maintains its monstrously engrossing splendor, but this time more illuminating as the sweeping vastness is insistently amalgamated with flamboyant range of sheets, both intricately mindscaping and balmily titillating. “Echoing Shade” promptly dives into magnificently expansive deserted solitudes, holding the unmistakable southwest signatures of no one else but Max Corbacho’s iconic guide. Panoptic serenity at its most majestic!!! “Transparent Phenomena”, at 4:17 the shortest piece on “Source Of Present”, rides on the wings of abundantly scenic and thrillingly overwhelming immenseness, where colossal drone layers continuously resonate, counterpoint and dazzle with ear-tickling glimmers. Nearly 19 minutes long title composition “Source Of Present” unfolds in absolute stillness and then calmly extends into an awe-inspiring panoramas of sheer atmospheric delight, incorporating own myriad of floating, reverberating, twinkling, glimpsing and crescendoing insignias masterfully reinforced by superiorly prodigious flickering mirages reminiscent of the master. A huge dose of sonic ambrosia is offered here!!! The closing 13-minute track “On This Journey” ceaselessly reveals and tightly keeps on the path of incredibly sublime sceneries, perpetually magnified by sweeping and ebbing vertexes, eternally enrapturing and staggeringly transporting. Evanescing tranquil horizons inconspicuously sneak in and are as much spectacular and soulfully exquisite as its quintessentially billowing and tenaciously monolithic companions. Gorgeously enigmatic finale! 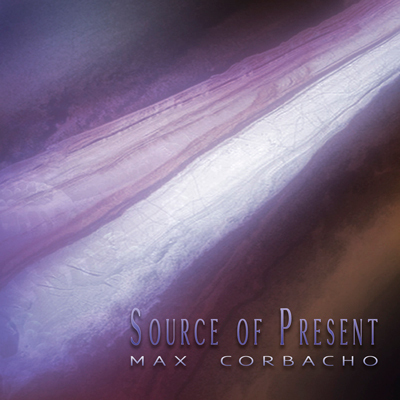 Although the amount of influential earmarks is to my taste a bit stronger at some stages, Max Corbacho returns with almost 74-minute “Source Of Present” masterwork, as well as with the previous “Nocturnes” album, to the ultimate pedestal celebrating all geniuses of powerfully engulfing atmospheric soundforging. That’s the place where he has already stood after sculpting unquestionable magnum opuses such as “Ars Lucis” and “The Ocean Inside”. And this position fits to him more than perfectly! Bravo, Max, you fully deserve this!!! !